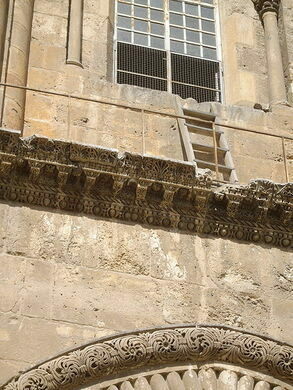 The immovable ladder of the Church of the Holy Sepulchre is a religious symbol of a sort, a kind of miracle possible only through human folly. It is also one of the most powerful and iconic symbols of the divisions and religious disputes within Christian World. 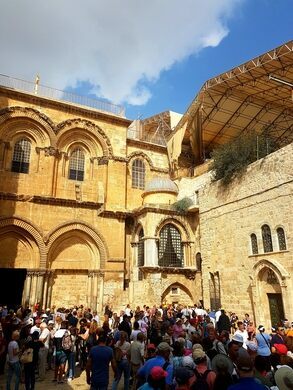 Proposed as the site of the death and resurrection of Jesus the Church of the Holy Sepulchre is one of the holiest places in Christianity and has been the site of pilgrimages since the 4th century. However, even this most venerated shrine could not escape the quirks of human nature, vanity, pride and envy. Even from its earliest days Christianity was subject to splintering, creating numerous denominations and sects, all claiming to be the only true school of followers of Jesus Christ. 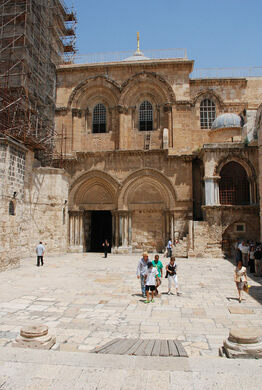 The most prominent of these fought bitterly over the centuries for the dominance over the holy places in the Holy Land. 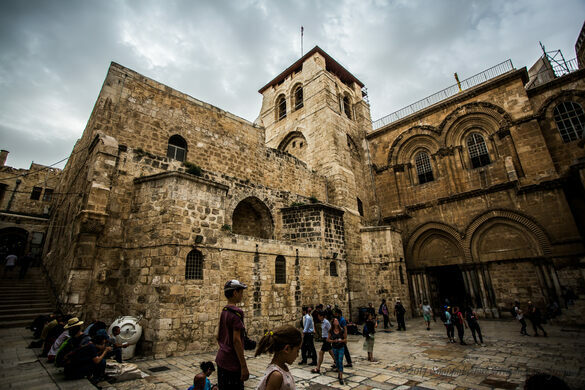 During the time of Muslim dominance over the area, a government equally hostile to all Christian denominations, no one sect could achieve a clear advantage over the others. As the disputes rolled on, the methods of gaining advantage became ever more dubious including outright bribery, blackmail, and the use of force. Today, the current situation is an uneasy status quo, a kind of an fragile compromise reached in several stages, through the mediation of the Ottoman empire and several European powers. The care over the church is shared by no less then six denominations. 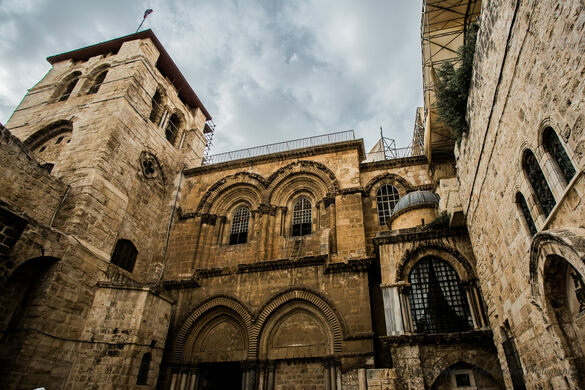 The primary custodians are the Greek Orthodox, Armenian Apostolic and Roman catholic church, with lesser duties shared by Coptic, Ethiopian and Syriac Orthodox churches. The whole edifice is carefully parceled into sections, some being commonly shared while others belonging strictly to a particular sect. A set of complicated rules governs the transit rights of the other groups through each particular section on any given day, and especially during the holidays. Some of the sections of the church however still remain hotly disputed to this day. Arguments and violent clashes are not uncommon. In November 2008 the internet was flooded with videos of a fistfight between Armenian and Greek monks in one such dispute. A small section of the roof of the church is disputed between the Copts and Ethiopians. At least one Coptic monk at any given time sits there on a chair placed on a particular spot to express this claim. On a hot summer day he moved his chair some 20cm more into the shade. This was interpreted as a hostile act and violation of status quo. Eleven were hospitalized after a fight resulting from this provocation. 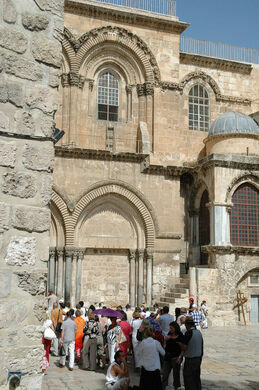 This state of affairs makes any agreement about renovations or repairs on the edifice impossible. 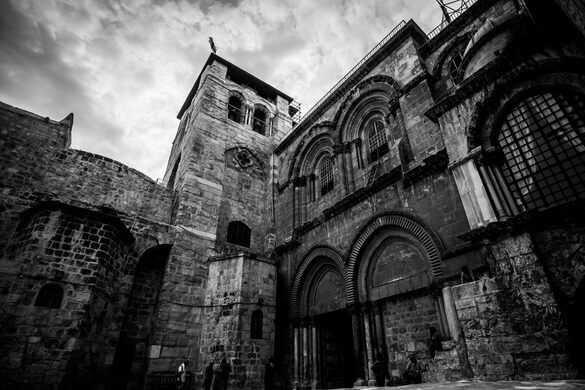 The church is in a state of decay as a result. 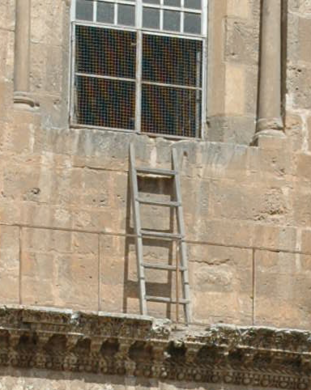 The famous immovable ladder is a bizarre outcome of this religious stubbornness pushed to extremes. 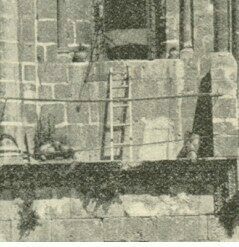 Some time in the first half of the 19th century, someone has placed a ladder up against the wall of the church. No one is sure who he was, or more importantly, to which sect he belonged. The ladder remains there to this date. No one dares touch it, lest they disturb the status quo, and provoke the wrath of others. The exact date when ladder was placed is not known but the first evidence of it comes from 1852. The ladder hasn’t moved since.